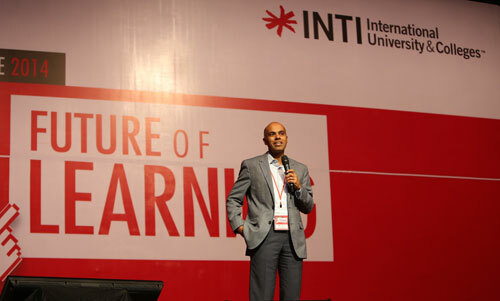 The Academic Conference, themed ‘The Future of Learning’ is the first of its kind at INTI and was attended by approximately 700 INTI academic staff. It included an impressive line up of international and local speakers, such as representatives from Pearson Growth Markets and Blackboard International who spoke on the topic of education, innovation and technology, as well as Pete Teo, Malaysian filmmaker and singer-songwriter who shared his insights into Gen Z and how best to meet their unique learning needs. Further demonstrating INTI’s commitment to embrace technology in teaching, academic staff were given an iPad each, and this was followed by a talk and demonstration on how to create a dynamic learning experience using iPads. “The fast-paced and evolving nature of technology has transformed the way we live, work and learn. To leverage from the opportunities that these changes bring, we brought together all of our academic staff with the goal of strengthening our teaching function and enabling them to further raise their performance by integrating technology into the learning environment,” said Amit Sevak, Chief Executive Officer of INTI International University & Colleges. “We believe that innovation in education is key to ensuring greater student outcomes in today’s digital age. We are committed to ensuring all of our teaching professionals are fully equipped to deliver 21st century education,” he shared. INTI academicians are not new to technology, as they have been using Blackboard, Flipped Classroom, Gamification and many other innovative teaching approaches in the classroom. Some of them had the opportunity to share experience and best practice with their colleagues during the conference. “Through the use of technology in the classroom, not only are students more engaged, they also have more control of their learning as they can pace their studies according to their own learning needs, interest and capabilities,” Sevak explained. “This approach, called Personalised Learning, can help build students’ soft skills – the 4 C’s, which are communication, collaboration, critical thinking and creativity – as students are more active, motivated and are able to reflect on how they learn. These are crucial skills that will give them an extra edge over their peers when they enter the global workforce in the future,” he added.